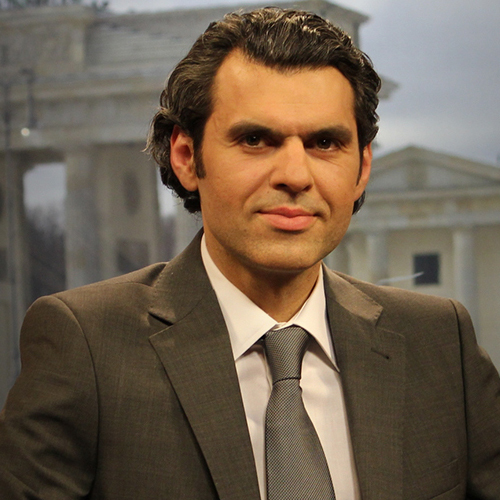 Ali Aslan is the host of the international talk show “Quadriga” on Deutsche Welle TV which can be seen by 200 million viewers worldwide. Born in Turkey and raised in Germany, Aslan has worked as a journalist for leading television networks around the world. His work at CNN, ABC News and Channel News Asia took him to Washington DC, New York, Istanbul, Barcelona and Berlin. Upon his return to Germany, Aslan ventured into politics, serving as a policy and media advisor to the federal government. He is a co-founder of the “German Islam Conference”, a high-profile government initiative which aims to improve the integration of Muslims into German society. Aslan holds a Master of International Affairs from Columbia University’s School of International and Public Affairs, and a Master of Science in Journalism from the Columbia University Graduate School of Journalism. He received his Bachelor of Science in Foreign Service from Georgetown University. In recognition of his achievements, Aslan has been named a Young Leader by the United Nations Alliance of Civilizations, the American Council on Germany, the BMW Foundation Herbert Quandt, the Atlantik-Brücke, the Koerber Foundation Foreign Policy Network, the American Jewish Committee, the Bertelsmann Foundation, the American Society for Muslim Advancement, the Konrad Adenauer Foundation and the German Marshall Fund.